James Cohan Gallery is pleased to present Continuum, an installation of three solo exhibitions by emerging artists Peter Matthews, Katie Paterson, and Karen Seapker. While formally distinct, these artists’ works share an interest in the mutual investigation of time and space and in the creative challenge of translating these abstract concepts into visual forms. Continuum will open on January 7 and will run through February 5, 2011. Peter Matthews creates his time-based drawings during meditative periods of extended immersion in the ocean. Informed by physical endurance, observation, and free association, his works seek to capture the constantly changing variables of the surrounding environment. Included in this exhibition are drawings the artist created in the Pacific Ocean off the shores of Costa Rica over periods of 4, 8, 10 and 14 hours. Executed with a variety of ink pens, the drawings accumulate into overlapping visual matrices of information which track events such as the flight of birds or patterns of breaking waves. Peter Matthews received his BA and MFA from Nottingham Trent University, Nottingham, United Kingdom (1998-2003). 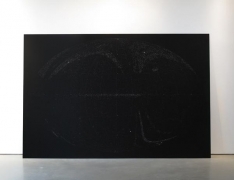 His work was recently featured in the exhibition Selections Spring 2010: Sea Marks at The Drawing Center, New York as well as at venues including Kunstraum Kreuzberg/Bethanien, Berlin, Germany; Santa Cruz Mountains Art Center, California; and Ráday Kepshaz Galeria, Budapest, Hungary. Matthews was shortlisted for the 2010 ING Discerning Eye drawing exhibition at the Mall Galleries, London, UK. He lives in Nottingham, United Kingdom and works around the world. Katie Paterson has become known for her multidisciplinary and conceptually-driven work with an emphasis on nature, ecology, geology and cosmology. Many of her poetic installations have been the result of intensive research and collaboration with specialists as diverse as Astronomers, Nanotechnologists and firework manufacturers. Among recent works included in this exhibition are: All the Dead Stars (2009), a large map documenting the locations of 27,000 dead stars known to humanity; Light bulb to Simulate Moonlight (2009), an incandescent bulb designed to transmit wavelength properties identical to those of moonlight; and History of Darkness (ongoing), a slide archive of darkness captured at different times and places throughout the universe and spanning billions of years. Katie Paterson received her BA from Edinburgh College of Art, Edinburgh, United Kingdom in 2004 and her MFA from the Slade School of Fine Art in London, United Kingdom in 2007, and has since participated in exhibitions at Modern Art Oxford, Oxford, UK; the Power Plant, Toronto, Canada; and Haunch of Venison, London, UK. Her work has also been featured in the Whitstable Biennial 2010, Whitstable, UK; PERFORMA 09, New York, NY; and Altermodern: Tate Triennial 2009, Tate Britain, London, UK. She exhibitionsly holds a John Florent Stone Fellowship at Edinburgh College of Art, and is the Leverhulme Artist in Residence in the Astrophysics Group at the University College London for the academic year 2010-2011. Paterson lives and works in Berlin, Germany. 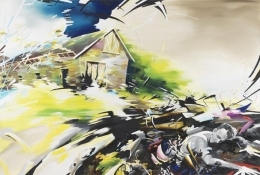 Karen Seapker’s paintings attempt to capture time and movement through the use of dynamic color and brush strokes. Her interest lies in the place where abstraction meets representation and how that encounter can confound moments in time and space. Windswept landscapes and waves that swirl across the surface create voids and vortices in which the viewer is invited to ponder the impermanence of time and memory. In Intangibles (2010), a mysterious male figure appears to disintegrate as a barn destructs behind him, suggesting a haunting cinematic denouement. Through the visual slippage created by the artist’s deft use of color and black-and-white, Seapker’s visual language at once suggests the unsettling distance between memory and fact. Karen Seapker received her BA from Muhlenberg College in Allentown, PA in 2004 and her MFA from Hunter College of the City University of New York in 2009. Her work has been included in exhibitions at James Cohan Gallery Shanghai, China; Dorsch Gallery, Miami, FL; Sloan Fine Art, New York, NY; and The National Arts Club, NY. Her work will be included in the exhibitions Gertrude’s/LOT, Pittsburgh Biennial 2011 at The Andy Warhol Museum, Pittsburgh, PA. Seapker lives and works in Philadelphia, PA. Please note: Katie Paterson's work 100 Billion Suns is a confetti cannon in which each piece of confetti is color-matched to the brightest known cosmic explosions in the Universe which burn 100 billion times as brightly as our sun. One cannon will be exploded each day at 3pm, creating a mini-explosion of all 3,261 universal explosions.